Ever since I was a toddler, I’ve loved carrots, especially when freshly pulled from the garden and rinsed. Of course, as a toddler, I didn’t wait for the rinsing – I ate them dirt, greens and all. I love carrots in cooked in soups, stews, with roasted meats, or with peas. I love them raw in salads or as crudite. Heck, I just love carrots. The first year of my garden, my carrots didn’t grow much in the roots, but there were all those carrot greens! I didn’t know what to do with them, but they reminded me (in looks) of parsley, and I’d been putting parsley in my smoothies, so I decided to try that with the carrot tops. It was great….until I read somewhere that carrot greens are toxic. Since then I’ve been researching this toxicity issue and have concluded that since many members of the carrot family are toxic in the greens, people assume that carrot greens are toxic too. And perhaps if you ate a whole bunch at one time, you might notice some problems. But a little bit at a time, unless you have an alergy to them, they should not be problematic. So, I continue to add them to my smoothies when I have the greens. 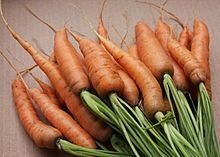 The Carrot Museum (UK) (1) talks about the toxicity question, and lists many ways in which carrot greens are used medicinally, as well as some interesting carrot recipes: tea, soups, salads, pesto, & gumbo. This recipe is adapted from All Recipes.com (2), with additional ideas from Fine Cooking.com (3, 4), and Whipped the blog.com (5). Serves 4. This recipe can be served hot or cold. Cook squash: preheat oven to 350°F. Cut squash in half. Scoop out seeds and place cut-sides down onto greased baking sheet or shallow casserole dish. Bake 30 – 40 minutes, or until soft. Remove from oven and let cool enough to handle. Then scoop out flesh from one half and set aside. Reserve other half for another use. Meanwhile, do prep: Dice onion or thinly slice shallots & place in bowl; mince garlic, sprinkle with ¼ tsp salt, and crush with side of knife blade, and add to onions. 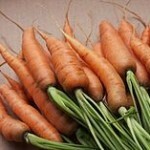 Scrub and dice the carrots, mince celery, peel ginger and slice thinly; place these in separate bowl. Cook: Heat oil in saucepan over medium heat. Add onion/shallot and garlic; cook, stirring, until onion is translucent. Add water/stock/broth and cooked squash, with carrots and ginger. Bring to a boil, then simmer until carrots and ginger are tender, about 20 minutes. Add spice mix, stir to combine and continue to simmer a couple minutes more. Puree in blender in batches, or with an immersion blender, adding boiling water as needed to thin. however, this is meant to be thick and creamy. Reheat (optional): Return soup to pan and reheat. Season to taste with salt, pepper and additional spices as needed. Optional: Serve hot or cold, with dollops of cream, sour cream, or yogurt. Testing 3/15/13: I start the juice fast tomorrow, so I made this as my ‘liquitarian soup” at the end of the prefast. Normally, that is served cold and raw, but I wanted to try this recipe. Made half-recipe, with 1/2 small acorn squash, and half chicken broth/half water. Seasoned with cinnamon and turmeric. Otherwise, as written. Did not add garnish, and served warm (not hot). This is very easy to make and it is delicious! I made it thick – didn’t add water to thin the puree. Background of heat and foreground of sweet. This entry was posted in Baked, Dairy, Fat or oil, Leafy Veggie, Root Veggie, Sauteed, Simmered, Spices, Stock, broth, Vine veggies and tagged carrot, cream, garlic, ginger, onion, spices, winter squash. Bookmark the permalink.